House lawmakers on both sides of the political aisle are upset because the Department of Veterans Affairs has not spent the entire $300 million it vowed to devote to post-traumatic stress syndrome among combat troops. ... The Government Accountability Office, the investigative arm of Congress, says in a report issued today that the VA spent less than half of a promised $100 million in 2005 on PTSD and $158 million of a promised $200 million in 2006. True spending on PTSD programs might be even less, the report says, because money released to VA medical facilities has not necessarily been spent, and even if spent may have gone to other purposes. GAO officials expect to issue a full report later this year with more details on what happened to the money. The wars in Iraq and Afghanistan appear to be taking a greater toll on the mental health of the so-called weekend warriors than on that of active-duty troops, the Army's leading expert on combat stress said during a congressional hearing Thursday. Army Col. Charles Hoge testified that 41% of National Guardsmen and reservists raised concerns about their mental health in answers to a survey taken three to six months after they returned from combat. That compares with 32% of active-duty troops who responded to the survey, says Hoge, a psychiatrist with the Walter Reed Army Institute of Research and an expert in post-traumatic stress disorder. In addition, a third of the citizen soldiers complained of problems serious enough that they were referred for mental health counseling; only 13% of active-duty soldiers were referred. The findings come as the Army, under enormous strain from fighting on two war fronts at once, considers greater use of its part-time soldiers in combat. "My own experience as a WWII veteran and involvement with other veterans over the years have made it crystal clear that returning stateside is not the end of the mission. A sizable percentage of the 1.2 million men and women who have rotated through Iraq and Afghanistan will experience significant readjustment challenges as they integrate back into their hometowns. For returning veterans, focusing on your readjustment now that you are home is a worthy, yet difficult mission because it often goes against your ideas of strength and courage. Actually, it takes guts to face problems and get help. I encourage you to make use of the many valuable services and resources available today. Both you and your loved ones deserve it. "More than one-third of Iraq and Afghanistan veterans seeking medical treatment from the Veterans Health Administration report symptoms of stress or other mental disorders -- a tenfold increase in the last 18 months, according to an agency study. "If the VA is going to see 30 percent of the 1.5 million U.S. service members who have deployed to the wars in Iraq and Afghanistan, the VA may expect a total of 450,000 veteran patients from these two wars," said Paul Sullivan, director of programs for the Vietnam Veterans of America Foundation. "This is a very ominous trend, indicating a tidal wave of new patients coming in, and the numbers could go up." "Twenty-one percent of Fort Lewis soldiers recently returned from Iraq were deemed 'at risk' for post-traumatic stress disorder. Between 15 percent and 17 percent of all combat troops returning from Afghanistan or Iraq suffer from depression, anxiety or PTSD. 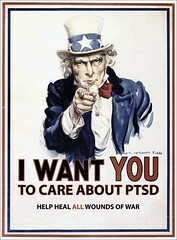 These brave men and women fight for our freedoms and we should support their mental health needs. Unfortunately, our national veterans outreach relies on unclear criteria for mental health referrals and on veterans seeking treatment on their own. Enhanced mental health screenings and outreach would help veterans get needed support." According to Army officials, the number of suicides committed by soldiers seems to increase when they return home. A headline today for a piece in the Chicago Sun-Times declares VA report: There is no Gulf War syndrome. Other headlines echoed much the same thing ever since an Institute of Medicine report was released earlier this week. Paul Davidson from the National Gulf War Resource Center yesterday issued a press release in response, and I've been asked to pass it along to you. Gulf War Veterans are questioning how today’s headlines became “There is no Gulf War Illness,” as a result of the Institute of Medicine report released earlier today. The previous 12 pages of text and following four pages of tables summarize a number of studies published over the last ten years which analyze “Unexplained Illness,” concluding that about 30% of Gulf War Veterans now experience or previously experienced this condition, and that is double the rate of occurrence among non-deployed veterans of the same period. In addition to recognizing the prevalence of “Unexplained Illness” among Gulf War Veterans, the OIM report also recognizes ALS, Chronic Fatigue Syndrome (CFS) and CFS-like illnesses, six birth defects (in the children of Gulf War veterans), atopic dermatitis, Post Traumatic Stress Disorder, and depression as conditions significantly more likely among Gulf War veterans than among non-deployed veterans. The report recommends Pre-deployment and Post-deployment Screening, Exposure Assessment, and Surveillance for Adverse Outcomes related to specific conditions such as cancer, ALS, and birth defects. SEC. 765. IMPROVED MEDICAL TRACKING SYSTEM FOR MEMBERS DEPLOYED OVERSEAS IN CONTINGENCY OR COMBAT OPERATIONS. (a) SYSTEM REQUIRED.—The Secretary of Defense shall establish a system to assess the medical condition of members of the armed forces (including members of the reserve components) who are deployed outside the United States or its territories or possessions as part of a contingency operation (including a humanitarian operation, peacekeeping operation, or similar operation) or combat operation. (a) shall include the use of predeployment medical examinations and postdeployment medical examinations (including an assessment of mental health and the drawing of blood samples) to accurately record the medical condition of members before their deployment and any changes in their medical condition during the course of their deployment. The postdeployment examination shall be conducted when the member is redeployed or otherwise leaves an area in which the system is in operation (or as soon as possible thereafter). (a) in anticipation of their deployment or during the course of their deployment, and records of events occurring in the deployment area that may affect the health of such members shall be retained and maintained in a centralized location to improve future access to the records. (d) QUALITY ASSURANCE.—The Secretary of Defense shall establish a quality assurance program to evaluate the success of the system in ensuring that members described in subsection (a) receive predeployment medical examinations and postdeployment medical examinations and that the recordkeeping requirements with respect to the system are met. Nationwide premiere screenings will be held this Friday for the long-anticipated documentary, The Ground Truth. Hailed as "powerful" and "quietly unflinching," The Ground Truth stunned filmgoers at the 2006 Sundance and Nantucket Film Festivals. The subjects of Patricia Foulkrod's searing documentary feature are patriotic young Americans - ordinary men and women who heeded the call for military service in Iraq. The terrible conflict in Iraq, depicted with ferocious honesty in the film, is a prelude for the even more challenging battles fought by the soldiers returning home - with personal demons, an uncomprehending public, and an indifferent government. As these battles take shape, each soldier becomes a new kind of hero, bearing witness and giving support to other veterans, and learning to fearlessly wield the most powerful weapon of all - the truth. If you can't find a theater near you, you're not out of options! Join with thousands of others hosting 'Ground Truth Gatherings' in churches, universities, community centers, town halls, coffee houses and living rooms across the country from October 4-11. Search for an event near you -- or consider hosting one yourself in your own community. DVDs are also available for purchase. For those who are searching for a way to understand the effect of war on loved ones or friends, this movie is a valuable resource. About September 11th, I can't add anything more that hasn't already been said. Many of you know I was a flight attendant for American Airlines on September 11, 2001. I'd been based in Chicago for most of my career, with side adventures flying international out of Miami and JFK in the mid-90's. I turned in my wings after 15 years in November 2001. I took the leap not out of fear, but out of a need to grow in new directions. Fortunately, I found that new direction last year: advocating for and writing about our returning veterans. (Steve Robinson of Veterans for America has asked me to share an LTE with you guys on this issue, and that follows below along with more news). 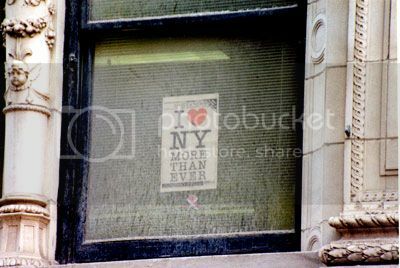 As for today, last year I submitted a photo essay in remembrance of the 4th anniversary, sharing pictures I took of my journey to Ground Zero three weeks following the attacks. Twelve months earlier, I'd submitted an essay describing my day and a few that followed, and asked others to share theirs as well. That diary turned out to be one of my most treasured, filled with some of the most incredible contributions. The looking forward part of my diary has to do with looking for ways to try to make the world a better place, and find my way in it since I left a career behind that I'd loved. Anyway, last year at this time I'd just begun getting curious about what was happening with our troops as they returned home to us. Two events led me down what would become my new life's path: 1) losing a sister to suicide in 2000; and 2) reading an August 31, 2005 Seattle Weekly article that talked about a handful of vets that had returned home only to commit suicide. From that article, and questions that flowed from it (Is this happening a lot? What's the military doing? Why isn't the media reporting on this? What can I do? ), I began the work that I had no idea would transform the direction of my life. Thanks to people at Daily Kos, and at My Left Wing, and at Political Cortex, but most most most especially the wonderful people, now friends and colleagues, over at ePluribus Media for the greatest support under the heavens. It's been an incredible year, and we've done a lot in that timeframe. I'm now in the final weeks of finishing up my first book, Moving a Nation to Care: Post-Traumatic Stress Disorder and America's Returning Troops. The process has been grueling, but filled with small little pockets of miracles and help from far and wide. Working with the military families who extended themselves and their stories to help with the book has been a humbling and deeply moving experience. One of those miracles came bundled in the work that I was able to do with Laura Kent, mother of 1st Lt. Phillip Kent, a soldier who committed suicide on September 28, 2005. His story will be presented among those of, sadly, many others. I believe I'm the first author she agreed to give the story to; her first news interview was just broadcast this evening. A video clip and transcript are now available at WIS-10/Columbia, SC. I won't go into sharing what the miracle was that she and I shared, but suffice it to say that if nothing else is accomplished with the book, it will have been worth it for my having had the opportunity to get to know Ms. Kent if even just a bit. (A thank you and deep gratitude to Wade Hampton for being the person to bring us together). So, while I pray for the victims of September 11th, I also pray for those lost in our new century's wars. I dedicate this diary to Phillip. And I continue to ask for your help as we move forward to do right by those who have been asked to give up so much. Paul Sullivan asked via Steve Robinson at Veterans for America that I share this with you. As a former Department of Veterans Affairs headquarters project manager who monitored returning Iraq and Afghanistan veterans, I agree with Paul Krugman's comment that the V.A. is a stunning success for quality medical care ("Health Policy Malpractice," column, Sept. 4). But the V.A. is running full steam into a brick wall because of a lack of capacity. Why? This administration failed to plan for the consequences of the Iraq and Afghanistan wars. The V.A. fell $3 billion short last year, and both wait times and the doctor-to-patient ratio rose. Nearly 1.5 million men and women have been deployed to war since 2001. Army research indicates that one-third of recent war veterans may need mental health care. The V.A. can expect a staggering 500,000 combat veteran mental health patients in the next few years. Sadly, Dr. Frances Murphy, the V.A. 's deputy under secretary for health, confirmed the V.A. 's lack of capacity this May, saying some V.A. clinics do not provide mental health or substance abuse care, or if they do, "waiting lists render that care virtually inaccessible." Without adequate financing and a comprehensive plan to increase capacity, the V.A. may spiral further into crisis and buckle under a tidal wave of demand. Army Surgeon General Lt. Gen. (Dr.) Kevin C. Kiley toured medical facilities Monday and Tuesday at forts Richardson and Wainwright, and spoke about healthcare initiatives in Alaska and Army-wide. Just a quick update. They say that writing a book is a lot like having a child. In the early stages, you're excited at the possibilities that lay before you. What will it look like? What will it sound like? At the end, you simply just want to get it out. I'm in that final stage now for the book, and it's got my full attention. It's going well. I've been fortunate to receive help from some wonderful military families, wonderful supporters. The pressure to produce something to honor everyone involved has me humbled and focused. Here's to a happy, er, Labor Day!